Integration firm VJVIT installed a PixelFLEX FLEXStorm LED display for the rooftop lounge at the recently renovated 300 Park Avenue.New York luxury real estate developer Rockrose Development recently began work on the renovation of its property at 300 Park Avenue. The project renovation was to include the creation of a completely new rooftop living experience. Wanting a dynamic visual display to be the focal point of the design, Rockrose Development called upon the team at VJVIT who installed an IP65-rated FLEXStorm LED video display from PixelFLEX. 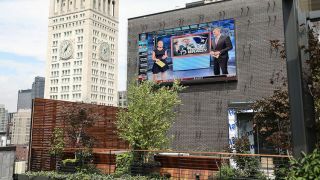 Designed to overcome the challenges associated with traditional outdoor LED video displays, FLEXStorm from PixelFLEX utilizes an auto-correcting light sensor control system to adjust the display’s brightness to ambient light levels throughout the day. With its IP65-rated connections, FLEXStorm is designed to weather the environment, and is available in a variety of custom sizes, resolutions, and configurations. With approval to move forward on the LED video installation, the team at VJVIT began to research potential solution providers. As this would be their first outdoor video install, Perez wanted to find an experienced provider who would serve as a reliable partner throughout the design. Now turning their focus to the physical construction aspects of the design, the team needed to determine how the FLEXStorm LED could be mounted on the rooftop deck. Utilizing the new construction that was taking place for the expanded elevator system, the design now encompasses a permanently fastened mounting bracket connected directly to the building itself. Ready to finalize the control system behind the design, VJVIT wanted to create an enriched experience by tying together elements of custom audio with the LED video. By developing a series of control points and output options, the rooftop deck is now able to accommodate a variety events, or a quiet evening alone. With the final design complete, it was time to now showcase the new FLEXStorm LED video design to the property owners and management team. Understanding the anticipation felt by many on the project, Perez was excited to unveil the new outdoor living environment, and it certainly did not disappoint.